After Diepenbrock had made two attempts at setting Brentano’s poem Der Abend (The Evening) for vocal quartet (see RC 88) on 22 August 1908, he drastically changed his approach. 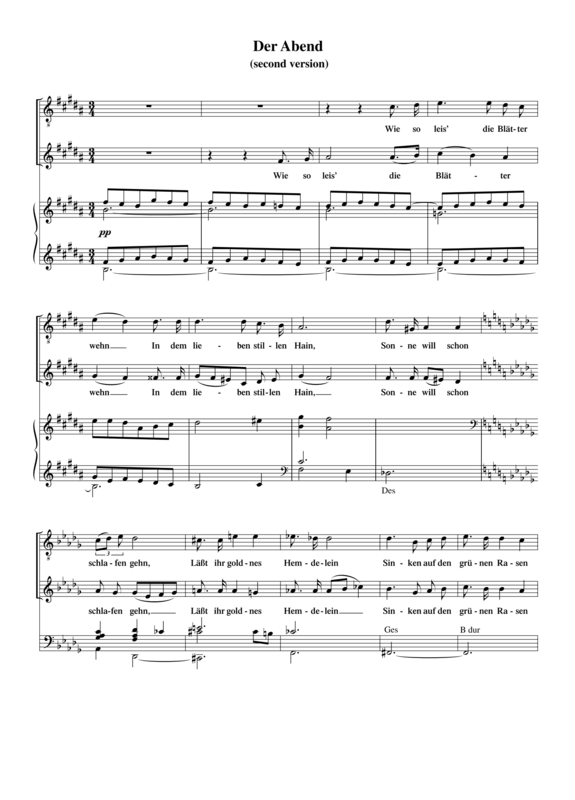 He chose a setting for vocal duo (soprano and alto) and organ, writing a melody in which a punctuated rhythm spices up the diction that deviates from the original 4/4 metre and is in a different key (B major). On the first four pages of a new sketchbook, C-8, he wrote a fourteen-measure fragment comprising five lines of the poem, in other words he did not complete the first strophe. Characteristic is the undulating quaver motion in the organ over an organ point. This undated fragment must have been written that same day, as Diepenbrock has sketched the first outlines of the definite version of this song for soprano and organ (RC 90) on the next page, which is dated 22 Aug.